What information do people ask you for over and over again? Setting up an online portal gives your audience (either employees, partners or customers) access to information they need, such as support cases, knowledge base articles, community forums, product guides and more. The core functionality of any CRM portal is to expose CRM data to users outside of the CRM system. All portal tools can do this. But the portal you choose will depend on the specific features that are important to you. For example, did you know that not all portal tools are compliant with government regulations. That could be a deal breaker for you. Microsoft Dynamics 365 includes a Portal tool. 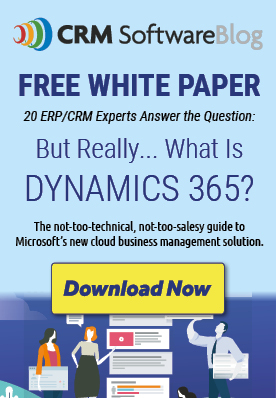 If you already use Microsoft Dynamics 365 you can start using it right away. Yes, it is government compliant, but that is not all you need to know. 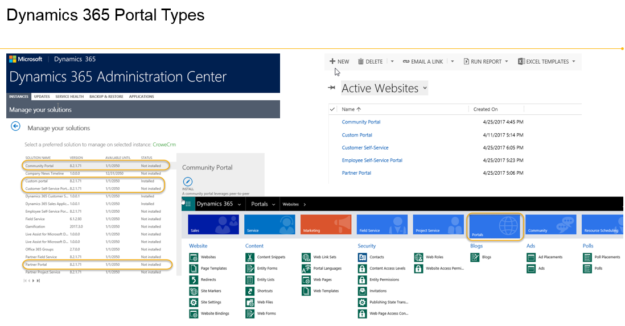 In this post we will do a complete review of the portal tool in Microsoft Dynamics 365 including background, types, configuration, licensing and our conclusions on the strengths and weaknesses. The Microsoft Dynamics 365 Portal was formerly known as ADX Studio Portal. This tool was acquired by Microsoft in November 2015 and now it is only provided as an add-on subscription for Microsoft Dynamics 365. The old ADX Studio Portal site was an on-premise asp.net web site, which means it could be hosted on a client’s own server. Since Microsoft acquired the technology, following their “Go mobile, go cloud” policy, the portal is now part of Dynamics 365 (online). The portal web site is fully managed by Microsoft and no customized asp.net code can be added to it. Also Microsoft Portal can only connect to the CRM instance within the same Office 365 subscription. Dynamics 365 has five pre-configured Portal solutions. You can start with one of these and then add your own pages and business logic. Customer Self-Service Portal (Feedback, Knowledge Base, Forums, Support, Case Management). Employee Service Portal (Feedback, Knowledge Base, Forums, Support, Case Management, Azure AD authentication). Community Portal (Feedback, Blogs, Forums, Ideas, Knowledge Base, Support, Case Management). This can be used to foster cooperation among your various audiences/communities. Partner Portal (Feedback, Forums, Partner Pipeline, Case Management, Knowledge Base, Badges, Opportunity Management). We can use this to coordinate with partner sellers and distribute sales opportunities to them. It is designed to be a platform for empowering your partners and giving them the tools they need to close sales. Each portal solution comes with a set of sample pages and templates that fits the corresponding portal audience. More portal solutions will be added in future releases. To understand the structure easily, you can consider the portal as a “Content Management System” (CMS) site that utilizes Dynamics 365 as the content repository. Ideally all the content and configuration should be stored inside CRM. The web portal only renders them to the outside. Once the portal add-on application is enabled in Dynamics 365, multiple solutions are installed within CRM. The new Portals tab is added to the CRM sitemap. It includes the entities we can use to configure and manage the portal. When enabling the add-on, only the pre-configured portal you picked will be installed. But you can use the “Manage your solutions” page to install other portal solutions. After the portal site is provisioned, you can go to the portal manage page to add further configurations such as the domain name and SSL certification. You can also switch the portal site to another pre-configured portal solution or connect the portal site to another CRM instance within the same Office 365 subscription. 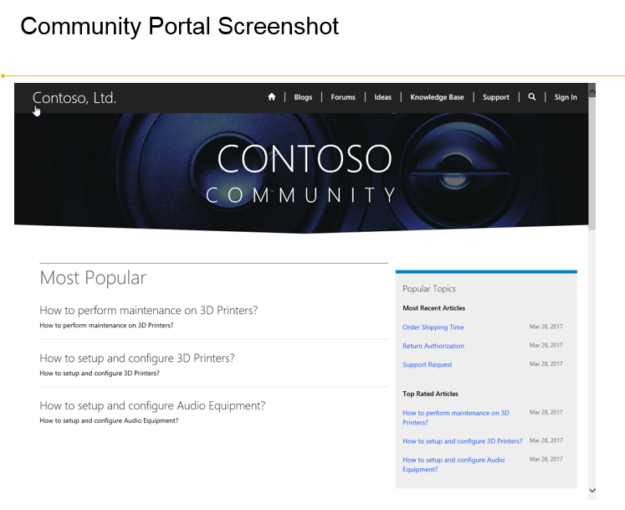 This screenshot shows the Community Portal to give an idea of what the pre-configured portal site looks like. 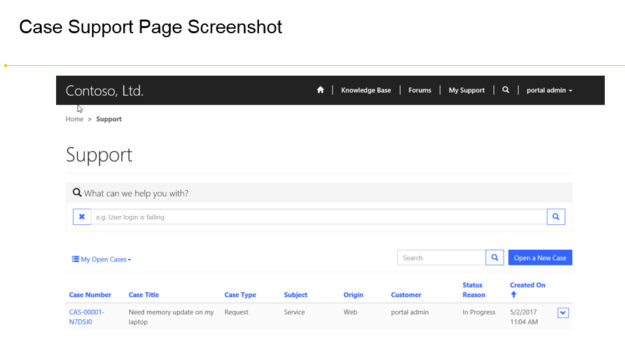 This is a sample case support page within the Employee Self Service portal to allow a user to open a new case, view an existing case or search the knowledge base. For full step by step instructions, download the Administrator’s Guide to Portal Capabilities for Microsoft Dynamics 365. The Microsoft Dynamics 365 Enterprise Edition Plan 1 subscription only includes one portal. You can purchase licenses for additional portals for use as non-production or production portals. The one portal that is included with any Dynamics 365 Plan 1 Business Application subscription is per tenant, shared across all Plan 1 Business Applications. A Plan 1 Business Application subscription is required to administer and configure the portal. Each Portal may only be associated with one instance. Internal users indirectly accessing Microsoft Dynamics 365 application data via a portal are required to have the appropriate Microsoft Dynamics 365 license. Unused capacity expires at the end of the month and does not roll over to the next month. Offering a portal is an excellent way to provide better service – to your customers, partners and employees. The portal included with Microsoft Dynamics 365 is a strong choice with a few weaknesses we hope are resolved in the future. Included with Dynamics 365 subscription, easy set up. No on-premise deployment support, no server code adjustments allowed. Adding multiple portals requires additional cost. Only documented extensibility is Liquid templates. Needs more extensions as solutions in AppSource (such as SharePoint, Payment, etc). If you are interested in evaluating Microsoft Dynamics 365 to see how your organization can use Portals, contact us at 877-600-2253 or [email protected]. Can a customer submit/create Sales Orders or P.O.’s using the D365 Portal? Yes. That’s a common use case scenario for portals and saves quite a lot of sales order processing time. CRM Portal supports only bootstrap framework or it does support Microsoft Web Framework (MWF) for UX design changes.